Before there was Eleni’s, Meat The Greek or Brother Hood, there was Olive Oil & Butter. Yes, the renaissance of Greek eateries in Yarraville and nearby suburbs was spearheaded by this Somerville Road institution. We’ve done two stories on it, but they’re getting old now. 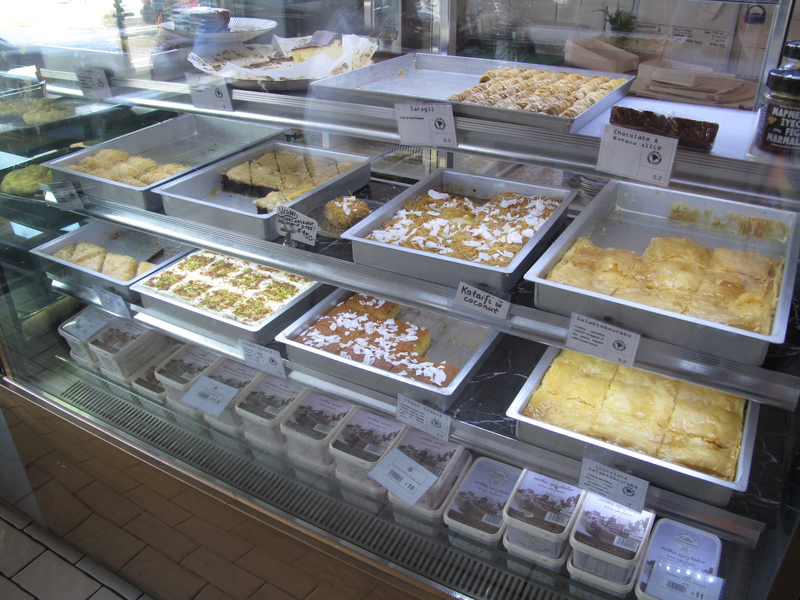 And in the meantime, Olive Oil & Butter has become a regular for us, but mostly for takeaway coffee and treats. Because we feel like it for a post-kung fu Saturday hoot and lunch. And because it’s worth recording that Olive Oil & Butter has expanded considerably, the dining area stretching down the back to an outdoor area. 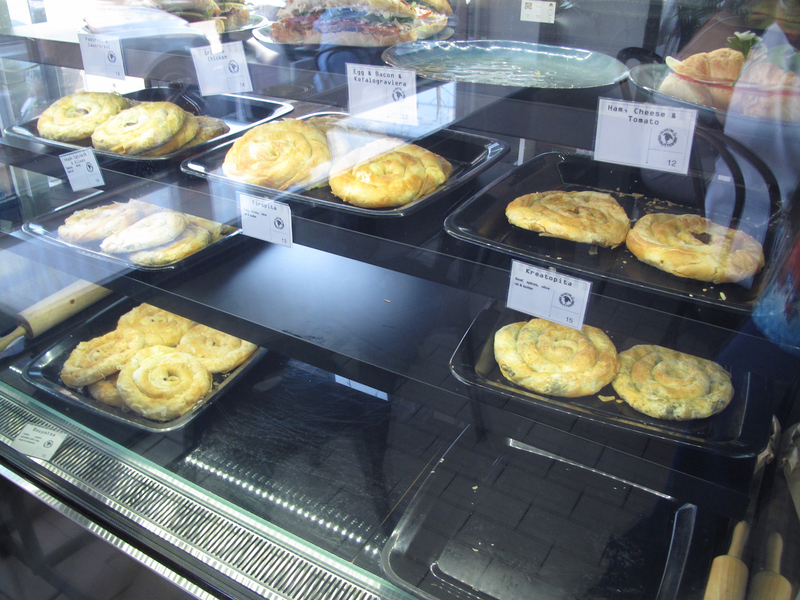 These days it’s got a lovely feel of a real-deal Greek eatery with happy bustle all about. 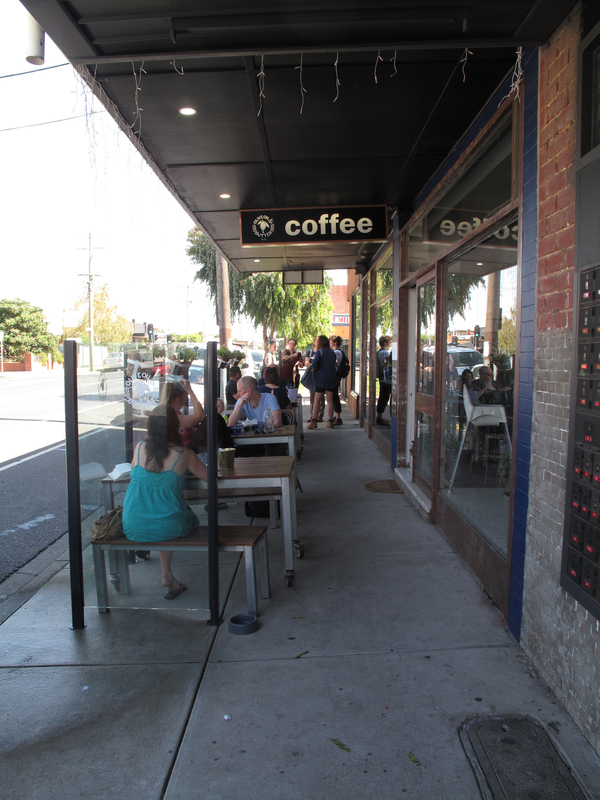 Of course, this is Melbourne, so coffee and breakfast are front, centre and popular. 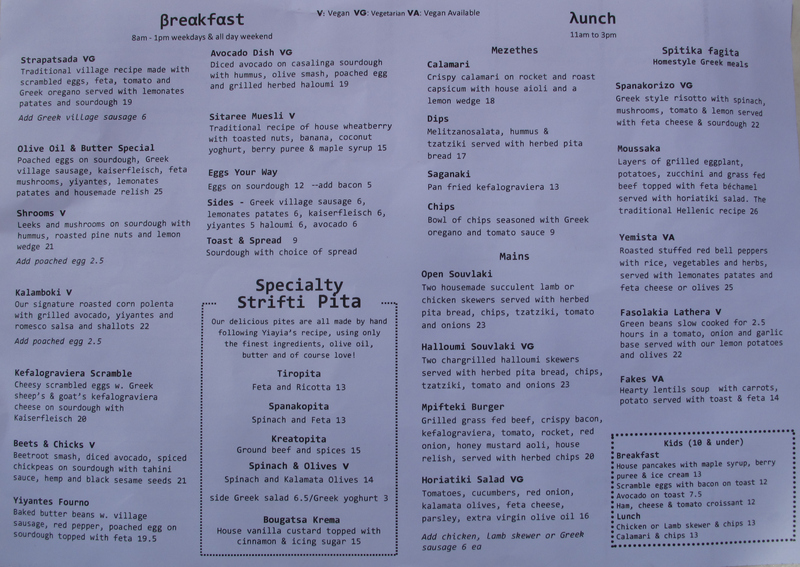 But the menu (see below) also features a nice round-up of rustic Greek dishes for lunch. It’s for them we’re in the house. Bennie opts for the open souvlaki ($23). All present and accounted for as per the menu – two fine skewers of lamb, herbed pita bread, chips, tzatziki, tomato and onions. He loves; he clean it all up. I suspect he’s probably making unkind comparisons of the price-to-quantity ratio kind with his beloved Brother Hood in Seddon. Buddy, that’s unfair – this is a sit-down restaurant situation and you’ve just had a lovely feed. I get, as recommended by our wait person, the fasolakia lathera ($22, top photo). Oh boy, this is so wonderful – green beans slow cooked in tomato, onion, garlic (and, I’m sure) a heap of olive oil. 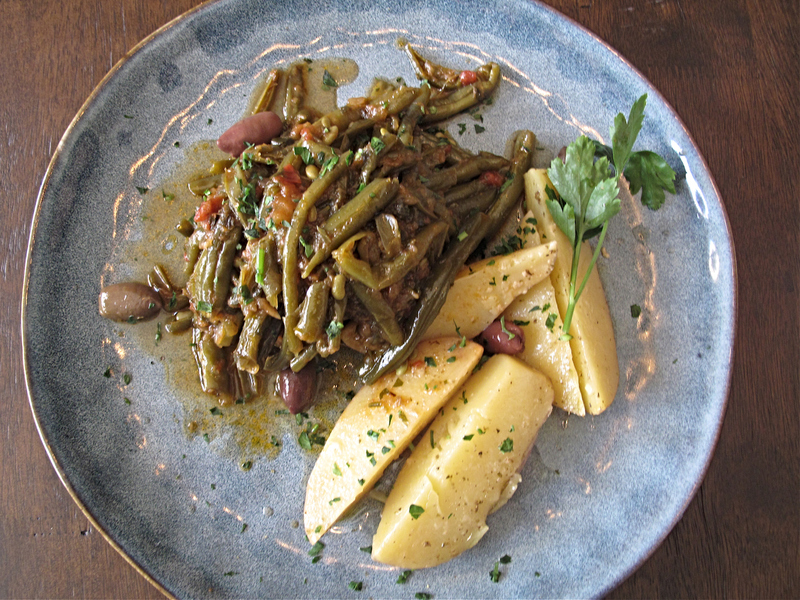 Ah, but there’s so much more here than that – this is rich and complex, the lemon potatoes and olives fit right in and it’s an ample serve for an all-veg dish. So delighted am I, that I have another look at the menu and take note of the other home-style meal available here – spanakorizo, moussaka, yemista, fakes – for future consumption. It’s these sorts of dishes that are the heart of Olive Oil & Butter. We spy only one seafood dish on the menu, for instance, and the lavish mixed grills you’ll find at other Greek eateries are absent. But, for me at least, that makes the place all the more appealing. 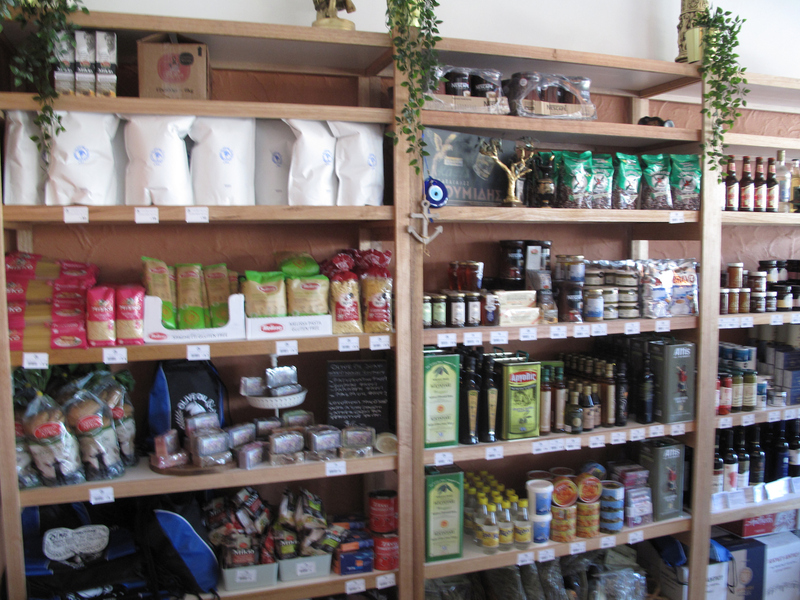 … and a nice line in Greek groceries make this a Very Cool Place. And the staff are always on-the-ball and smiling. See earlier stories here and here. Its great since the reno, more open and airy. Staff are lovely. Best of all … the courtyard is p et friendly so no longer have to endure the traffic noise sitting out front. That souvlaki looks delicious. 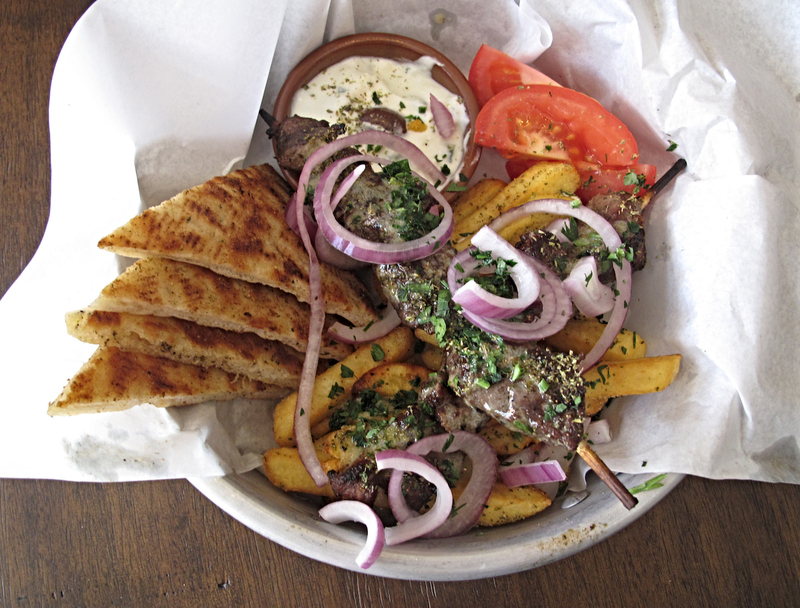 I’m in love with greek foods, and I might visit one day that taverna.